Lazy Sundays are made for Hammocks! Tags: "hammock", "traveller lite hammock"
It’s a beautiful Sunday in Brooklyn, and perfect for lounging in a hammock. What, no hammock? No problem! We’ve got you covered with our Traveller Lite Hammocks made of lightweight and strong polyester parachute fabric. It’s perfect for camping or trips to the beach, and folds up into a compact pouch for easy storage and travel. So grab the crossword, swing into a hammock, and get comfy! 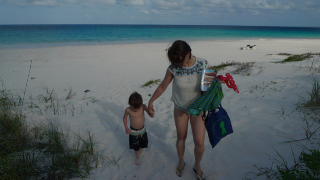 Tags: "Annie's Blue Ribbon General Store Tote Bags", "Annie's Blue Ribbon General Store"
We love seeing our Annie’s Totes used around the world (remember Megan sporting hers at the Equator in Uganda)- here is another friend & customer, Suzanne- on the beach (in Harbour Island, Bahamas) with one of our Totes!! Going to the beach? Pack up your Annie’s Tote today! But don’t forget the sunscreen! Our Porcelain Lanterns in Real Simple’s Daily Finds!! Tags: "camping lantern", "daily finds", "porcelain lantern", "Real Simple"
More love coming our way from Real Simple this week! Our incredibly clever Porcelain Lanterns, which look just like those beautiful old-fashioned camping lanterns, was featured in their Outdoor Party Lights feature. Thanks, Real Simple!! Tags: "Aden and Anais Swaddling Blankets", "Annie's Blue Ribbon General Store", "Jungle Jam Swaddling Blankets"
It’s my first few days of Motherhood, our baby girl is 10 days old! One thing you learn early on is that babies LOVE to be swaddled, and Coco is no exception. The Burrito Wrap style is comforting for the little ones who are used to be nestled in their Mama’s warm and protective womb. We have been selling these Aden & Anais Swaddling Blankets for over a year now, and everyone raves about them- but now I know first hand how much they rock. They are made with muslin- which is so light weight and easy to wrap. With this East Coast heat wave, the muslin is particularly appealing for its’ breathability too. Not only do we use them for swaddles, but we just took a little walk along the water and draped the blankets over the stroller to protect our little girl from the sun. LOVE them! 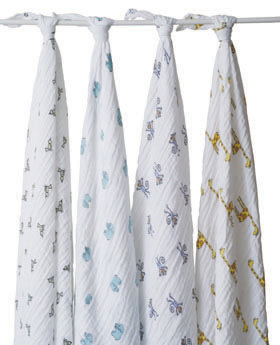 4 pack of Jungle Jam Swaddling Blankets– $44. (BTW- between spit- ups, baby drool, and the various uses for these blankets- a 4 pack is a PERFECT gift for new parents!). Hydros Bottles in New York Magazine! Tags: "filtered water bottle", "hydros", "New York Magazine"
The latest issue of New York Magazine is out, and they chose our Hydros Water Bottles as one of their “Best Bets” this week. There are so many styles out on the market, and new ones coming out every day. What makes the Hydros special is the built-in filter so you know your water is clean wherever you are. 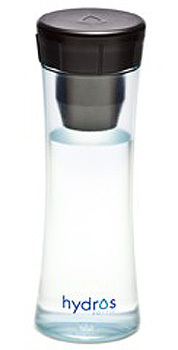 The bottles are also BPA-free and made in the US! Tags: "Hot 8 Brass band", "Sexual Healing"
I love music. Who doesn’t, right? I’ve always thought that was a strange question on a date. As if anyone would ever answer “Why no. I hate music.” But I really love music. I need it playing in my headphones at all times as I walk around the city, and usually at least in the background while I’m home. In fact, my chief complaint in the summer is that I can’t hear the music over our AC. People often comment on it here, and the general consensus is that it’s great. We don’t use a subscription service or satellite radio, but rather Annie’s massive personal music library. It’s a huge mix, and you never know what you’re going to get. As I write this I’ve heard Bob Dylan, Jack Johnson, and even Groucho Marx! I’ve been introduced to tons of new music since I began working here–some of it silly and some of it beautiful. I’ll leave you with one of my favorites from our collection. I heard this on my first day here and immediately became obsessed. It’s a phenomenal cover of Sexual Healing by the Hot 8 Brass Band out of New Orleans. Tags: "Annie's Blue Ribbon General Store", "Bubblegum video", "Rob Cantrell"
Ohh yeah it’s full on summer everyone! Need something cool to chill out to? Check out my Big Gorilla’s latest rap song and cool video, Bubblegum. It is shot all around NYC including our favorite Coney Island (where we had our first date 7 years ago today!). Need some gum to go with it? We’ve got you covered with Fruit Stripe, Gold Nugget Gum, Gumball Cones and more!